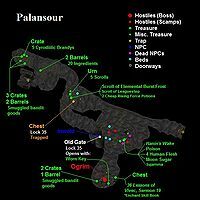 Palansour is a cave in West Gash containing daedra and a sad sorcerer. 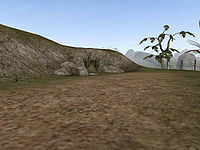 The cave is a short way southeast of Ald Velothi, and south of the nearby Daedric shrine of Ashalmawia. Outside its partially submerged northwest entrance, there is a dead, viciously clawed smuggler in a boat. There are several sacks and things around him containing treasure. A gang of smugglers' experiments here went wrong. Evidently they were dabbling with summoned scamps and an ogrim. However, the summoned creatures got out of control. The book Hanin's Wake, located on a table in the center, hints at what morbid things happened here. All but one of the smugglers are dead, and the survivor is kept in a small area (look up east in the central room), that can only be reached by levitation. Imprisoned behind a locked gate, Inwold was forced to wear women's clothes for the amusement of his captors. There are a fair number of crates of generic smuggler loot around, and more stuff on the tables. Booze, skooma, and moon sugar are included among the smuggled goods. There are at least three levitation potions in the cave, so there's always a way to get the sorcerer out of there. This cave is the only location for the alchemical ingredient human flesh. The expansion pack Bloodmoon adds three additional samples. A Worn Key that opens the locked Old Gate with the sorcerer is located on a plate in an alcove, near the hanging skeletons. This cave is one of the only two locations for the alchemical ingredient poison. The other location is Mudan Grotto.